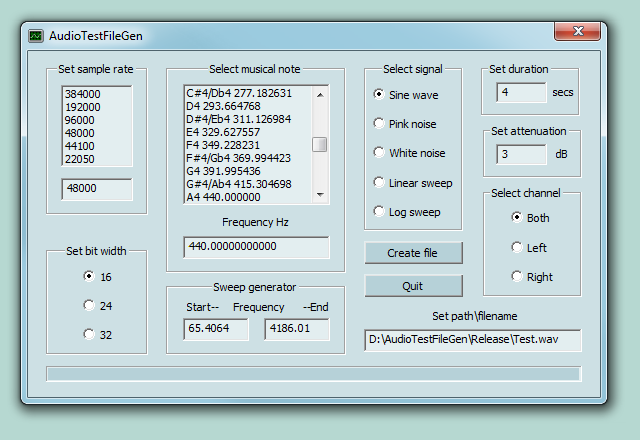 Generates Window's RIFF Wave Format audio files with stereo, 16 bit sine wave signals of the highest precision, in the full range of 10 Hz to 22050 Hz, at attenuation values from 0 to 60 dB. It also includes a Pink Noise generator. The selectable musical notes are calculated to a precision rounded up to 11 decimal places, becoming a precise standard reference for the modern Even Tempered Scale to which you can calibrate your equipment and musical instruments. Creates files of 16, 24, or 32 bits per sample. Gaussian White Noise generator added. Generates files of up to 2 minutes in duration. Posted by Tom Hyltin on Thu, 01/11/2007 - 02:26. Using the computer to generate a test signal for servicing is great, but this needs the ability to generate real time, continious signals, and pout them our the earphone jack, not to a file. The big problems is the shortness of the signal. Posted by George Taylor (via moderator) on Mon, 07/30/2007 - 04:05.
: The big problems is the shortness of the signal. The signal duration is user adjustable to up to 60 seconds. If you need a continuous signal, play it in a loop or take the file into your favourite sound editor and make it however long you want it.